This is a delightful rich soup with a sweet vegetable taste and it has become one of our family favourites. I make a large batch in the autumn, when sweet red peppers are plentiful, and freeze it in serving sized portions. The recipe below will yield 6 - 8 servings and the half bushel of Peppers that I pick up at the farmer’s market, (I just can’t grow that many,) allowed me to make 5 times this recipe. I do that all as one big batch. You need a rather large cauldron. The peppers need to be peeled and this is the hardest part of this recipe. I boil them with the peels on and then run them through a food mill. This makes the soup very smooth and catches all of the skins as well as any seeds or other stray bits that found their way into the pot. Size is not critical, just remove the seeds and chop them up. Some - Hot pepper flakes or fresh hot peppers, to your taste. Melt enough butter in large skillet to saute the onions and garlic until soft and aromatic. Heat the chicken stock in a large saucepan and add the garlic and onions when ready. Melt more butter in the skillet and saute the pepper pieces until they are slightly soft. Keep the heat low enough that you do not brown them. About 10 minutes. Add these to the stock. Add the fresh herbs to the stock and simmer for a few minutes. Add salt and pepper to taste. 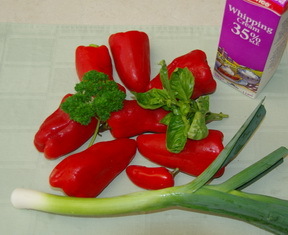 Bring to a boil and then simmer, covered, for 20 - 25 minutes, stirring occasionally, until the Pepper pieces are quite soft. 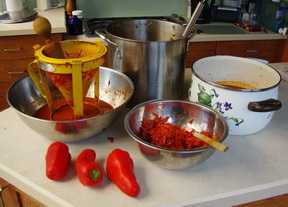 Push the developing Red Pepper soup through a food mill to remove skins etc. Add the whipping cream and just return to a boil stirring regularly. 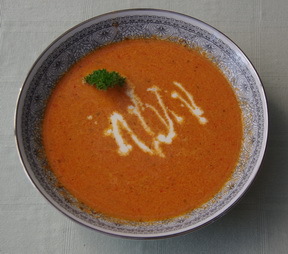 Serve your Red Pepper Soup garnished with drizzle of cream and a bit of parsley. Don't worry I promise to use your e-mail only to send you Dallying In The Dirt. I'm to busy gardening to even think about sending out junk.